Often accompanied by students from the UW and around the United States, Kyes spends about seven months of the year traveling to remote sites in places such as Indonesia and Nepal, leading study abroad programs and conducting field courses and K-12 outreach efforts for local people. 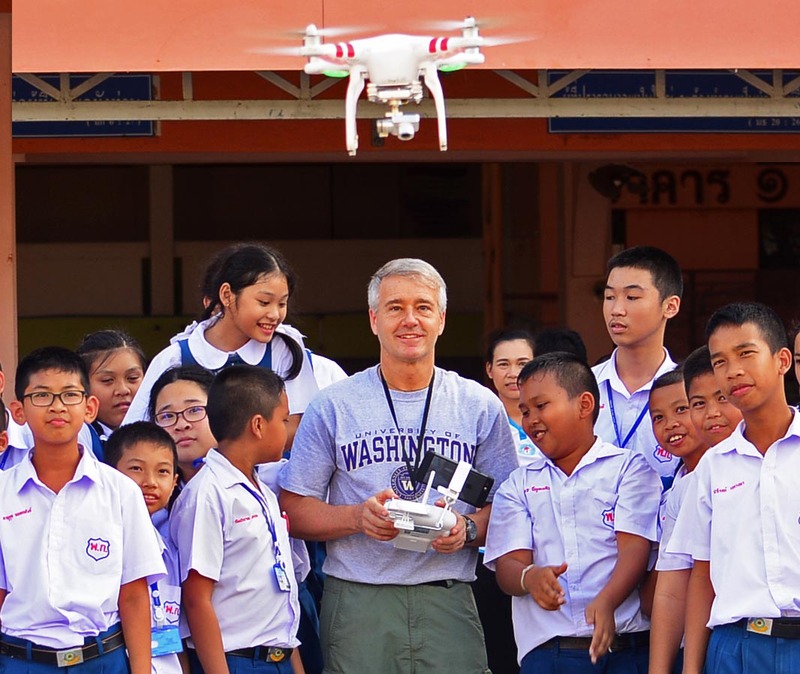 In late July, Kyes — who is also a research professor in psychology and an adjunct research professor in global health and anthropology — will lead his 100th field course, in Thailand. He sat down with UW Today recently to talk about his work. What type of work do you and your international colleagues do? RK: We focus on the interface between environmental health and global health, stressing the importance of understanding that what we do to the environment obviously impacts the environment, often negatively, and those effects can come back and impact human health in a negative way. Likewise, if you reverse that, we can improve environmental health and also our own health. One of our goals is to help educate the local people in the countries where we work so that they can take the leading roles in the management of their environment and promoting global health in their country. The field courses we do are really geared toward helping develop that next generation of leaders within any country to take on these roles. They are done 100 percent in collaboration with our key partners, who also provide lectures in their area of expertise, and that allows them to also cover topics that are relevant to that country or region. You also do educational outreach programs for K-12 students. Can you tell me about that? The next year, 2001, we started our very first outreach program for these children. We gave them a presentation about the importance of wildlife and the interaction with humans, then we had an art contest about the environment and good health practices. It was a big hit. We went from that one in Indonesia to including that with our field courses in all of these countries. How effective has that outreach been? RK: About 10 years after that first outreach, we were doing our field course in that same location. There were two girls from the village taking the course. 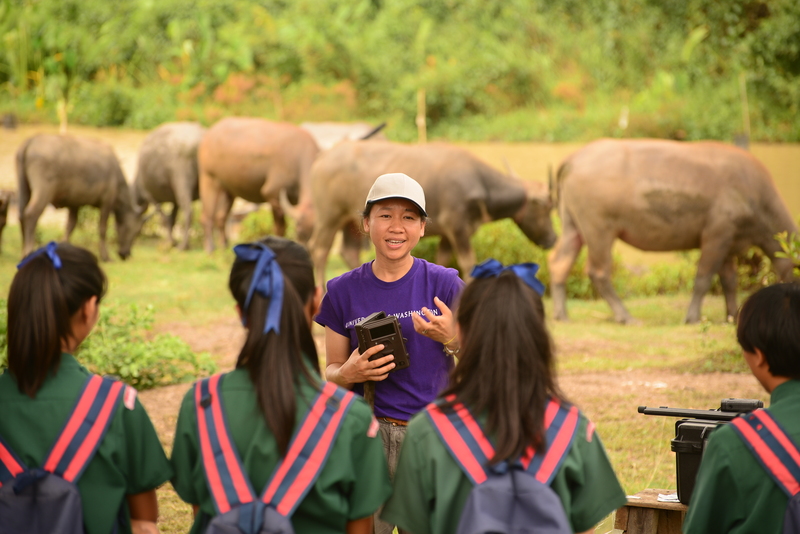 They said, ‘When we were kids, you came to our school and did the outreach.’ Those were two little third-graders in our very first outreach who had now grown up and were young adults taking the field course. In every field course that we do with these young adults, we’re now getting three, four, five local village kids joining who took our outreach when they were third-graders. This is the full circle. And you don’t see these really neat kinds of benefits, connections, progress if you do it just one or two times and move on. To the extent you can keep something going, and a momentum builds behind it, and people get to see it as a regular thing — they anticipate it, they want to join, they become part of it — that deserves real attention. I wish there was more funding to support these kinds of programs to help them go for longer terms. How did you get started doing this work in foreign countries? The next summer, I made my first trip to Indonesia. At the end of that summer, Dondin asked if I could come back the next year and do a field course to help train students on how to study primates and do field work. That’s how it started. Then in 1995 I started taking American students. Last year we hit the big milestone of 25 years of that field course and 20 years of bringing American students. How did this expand to other countries? RK: It first expanded within Indonesia a few years later. 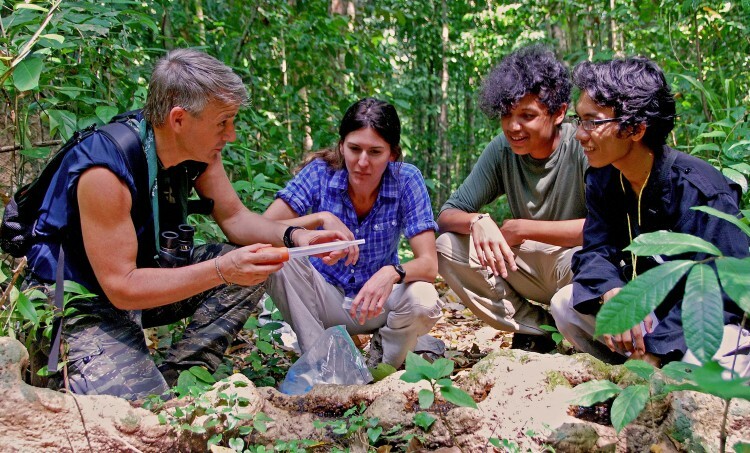 And then colleagues from other countries said ‘Oh, we’d love to have you come and do a field course here.’ We started one in Nepal, then China, then Bangladesh and Thailand, and it just went on and on. I have so many collaborators now who would love to have the same kind of program for their students, but we just don’t have enough time, and of course funding is another limiting factor. But what I’ve tried to maintain throughout all of this is the consistency. We try to maintain these on an annual basis, but it doesn’t always work out in any given year because of various things, whether it’s funding or political issues. In the Democratic Republic of Congo, sadly, we’ve missed several years because it’s in that northeast quadrant, where a lot of the ongoing border dispute and other militia activities continue. In Nepal we’re up in the Himalayas. You’ve got a three-day hike just to get up to our field site in Langtang, a remote mountain village. This is where a landslide and earthquake in April 2015 wiped out the entire village. It happened about a month and a half after we left from our annual field course. There were more than 100 known dead and many, many more missing. We’ve been going there for 12 years doing our research and training, so I knew these people well for years. It was just wiped away. What are some of the challenges and rewards of working in all these countries? RK: The biggest challenge is lack of time to do all that we want to do. The next one obviously is funding. For me, the rewards are getting to meet and become friends with so many people around the world. They’re like family. Oftentimes, I stay with my colleagues in their homes. I get to see their kids grow up. I’m in Buddhist countries, Muslim countries, Christian countries and areas that have no predominant religion. Sadly, most people in the world will never be able to travel outside of their own little area. If they could, they would understand that regardless of culture, religion, whatever, everyone is the same. They want the same things. It struck me early on and continues to be reinforced over and over and over, that sameness across the world. That’s why I believe so much in the importance of traveling abroad. You don’t get the full appreciation by watching a TV show or a documentary. You don’t get it by staying at a Best Western. Few people will ever get the kind of exposure that I’m talking about. But the students who get to do a study abroad have the best opportunity of getting close to that. It’s real immersion. Those for me are the big benefits, the things that have forever shaped my life and my perceptions.